AFTER the historic Assembly election in the North, Sinn Féin’s team of newly-elected and returning MLAs were back at Stormont but it was far from business as usual. Prior to the election, Sinn Féin’s leader in the North, Michelle O’Neill, had made it clear that there would be no return to the status quo at Stormont and the party has lived up that election pledge. 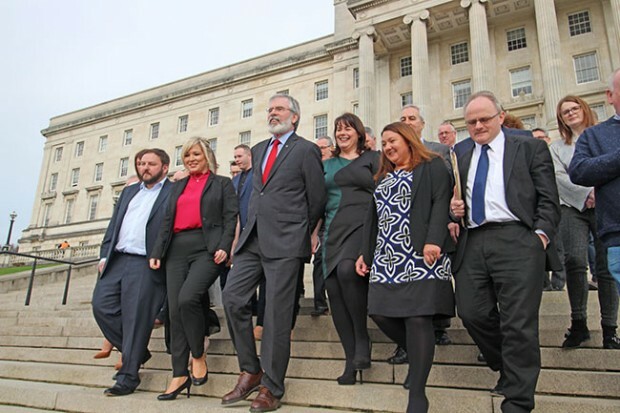 On the Monday following the election success, the full Sinn Féin Assembly team of 27 MLAs arrived at Stormont for a group meeting to discuss the next move as all parties prepared for negotiations in a bid to get the political institutions back up and running. Newly-elected MLAs such as Foyle’s Elisha McCallion, South Down’s Sineád Ennis, Fermanagh/South Tyrone’s Jemma Dolan, and West Belfast’s Olaithí Flynn sat alongside long-standing Assembly members including West Tyrone’s Barry McElduff, West Belfast’s Fra McCann and Alex Maskey – veterans of the first Assembly in 1998 – to hear that Sinn Féin will only be involved in a government based on the principles of equality, integrity and respect. Although the Assembly will not hold a proper sitting until a resolution to the current difficulties is found, all MLAs had to sign the Assembly register. This involved all 90 members filing into the chamber and taking their seats to wait to be called to sign in. The gathered press pack in Stormont’s Great Hall noted the impressive sight of all Sinn Féin MLAs coming down the famous staircase en masse to troop into the chamber and many commented on the number of young women in the ranks of the Sinn Féin team. This was in start contrast to the DUP, whose members drifted into the chamber in dribs and drabs, coming down in pairs or alone, which many took to be an indication of a party still licking its wounds after a poor performance at the polls. Or perhaps it was a signal of an unwillingness to line out behind embattled leader Arlene Foster, under fire over her handling of the RHI scandal and bearing the brunt of the blame for not avoiding the loss of the unionist majority at Stormont for the first time in history. The shrunken Ulster Unionist Party contingent, now leaderless following the resignation of ex-TV presenter Mike Nesbitt, who held on to his seat, looked even more at sea than usual, trying to present a cheery face going into the chamber but failing miserably. Inside the chamber itself, the amount of extra space with the reduction of MLAs from 108 to 90 was noticeable, particularly on the DUP benches, with the absence of such ‘big beasts’ as Nelson McCausland and Maurice Morrow failing to keep their seats. The high-profile Emma Little Pengelly also lost out. Other heavy-hitters were also absent. Former Ulster Unionist Party minister Danny Kennedy and senior SDLP MLA Alex Attwood were both deemed by the electorate to be surplus to requirements. 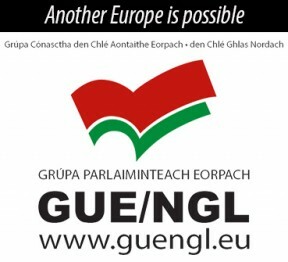 And any future Assembly will certainly be a quieter place with the involuntary departure of People Before Profit’s one-term MLA, Eamonn McCann. Aside from the formalities, the real business at Stormont since the election has taken place at Stormont Castle, where the talks have been taking place. Regrettably, as a result of British Government intransigence and the Irish Government failing to hold the British to account, little progress had been made as I file this report. The British Government’s Secretary of State, James Brokenshire, was left in no doubt about the state of play, however, when a meeting with Gerry Adams and Michelle O’Neill at Stormont Castle was ended by Sinn Féin very shortly after it began. Gerry Adams promptly went out and told the waiting media that Sinn Féin made it clear to the Tory MP sent over by his government in London that unless he had anything to offer other than “waffle, waffle and more waffle”, then the meeting was over. A chastened Brokenshire, unused to such meetings owing to his complete lack of experience, then ordered his Range Rover round to the back of the Castle so that reporters would not see him clambering in to make a hasty retreat. 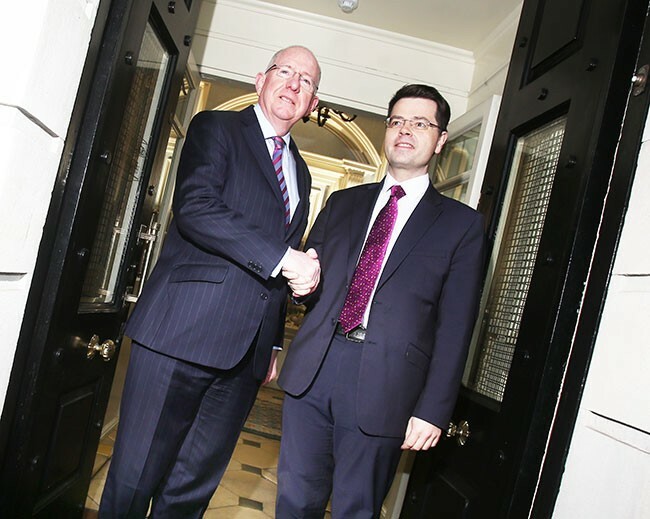 While his skills are certainly lacking, James Brokenshire did not even turn up for negotiations on St Patrick’s Day. Nor did Irish Government Foreign Affairs Minister Charlie Flanagan. The Sinn Féin team was there, of course. It’s certainly not back to the status quo but it is back to business.